Leapforce Reviews - Legit or Scam? Leapforce Reviews – Legit or Scam? Leapforce is a US based company that hires independent agents to run their own home based business, with no set hours or schedules, and at what they say is a competitive wage. While Leapforce assigns projects to their At Home Agents, you will have total freedom to choose when and how you’ll work. As you complete a project, simply keep a log of the hours you worked to provide to Leapforce at the end of the month. Once you have provided Leapforce with your monthly invoice, you will be paid within the next 30 days. In order to remain an active Leapforce agent, you must complete a minimum of 200 evaluation tasks every 30 days. 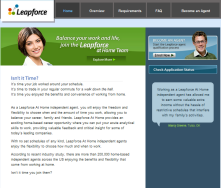 It is free to apply to be a Leapforce At Home Agent. Leapforce agents are paid to perform online research for the multinational companies they partner with. Once you complete your research, you’ll need to evaluate your findings and provide them to Leapforce so they can be passed on to the company who created the assignment. In order to qualify as an At Home Agent, you will need to pass a two part exam which will show that you can adequately perform the type of work that will be required. The exam will test both your theoretical and practical comprehension of search engine evaluation. The test is difficult, so you must make sure you have the time to give it your complete attention. If you fail one or both parts of the exam, it will be considered a failure and you will not be allowed to take the exam again. In order to work with Leapforce, you will need to have high speed internet access, a personal computer with Mozilla’s latest Firefox browser, and up to the date anti-virus and anti-spyware software. You will also need a personal space at home in which to work; due to the sensitive nature of many of the assignments, working in public spaces is not allowed. You must also have excellent skills in research, analysis, comprehension, and written communication. Some assignments will require agents to be fluent in other languages. Finally, you must be 18 years of age and since you will technically be an independent contractor, you must make sure that you are in compliance with IRS tax practices.